In an effort to have beautiful, vibrant hair, we resort to treatments and products. After a while, treating and using product on your hair (plus regular daily abuse) can cause it to become damaged. Damaged hair happens when your cuticle is negatively effected by chemicals, heat or treatment. It is usually dry, rough and frizzy. Sometimes hair becomes damaged because you aren’t quite careful enough using products at home. If you blow dry your hair, use the lowest heat setting and leave your hair a little damp. Let it finish drying naturally. Also, use dryers with a nozzle attachment so you can target specific areas of your hair better. If possible, use a conditioner that includes sunscreen to help prevent damage from the sun. Wear a hat or scarf when it is windy out. Use a wide-toothed comb instead of a brush to remove tangles. To protect your hair from chlorine, wear a swim cap in the pool. 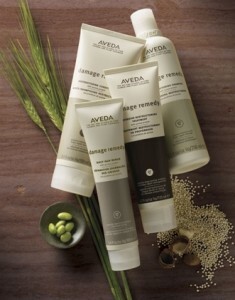 Aveda’s Damage Remedy line will help to repair damage with quinoa protein. If you notice that your hair is starting to look damaged, stop using heat products or heated treatments on your hair. Avoid bleaching and coloring. Also, talk to your XEX hair stylist about a healthy hair style that would work best for you. We can help you find the perfect style that won’t require products or treatment that will damage your hair. thank for the great advice!!!! Wide toothed comb – I have always used a brush.